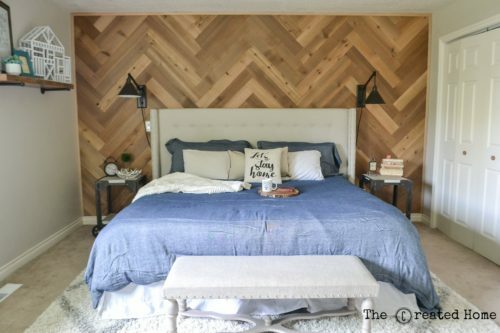 A few months back I surprised my husband with a bedroom redesign completed while he was at work. It was an eight hour makeover several months in the making. I want to share that reveal with you, a bit belatedly, because we recently completed the accent wall, which I shared here. This was a seriously fun project. Initially I planned it for when my husband was supposed to be gone on a business trip. That trip ended up being canceled, and at the time there were multiple stress factors going on at once. One day I just decided I was done waiting, and worked all day to pull together a new look. My goal was to make our room more of a comfortable retreat for us, but to do so on a budget. This was our sad master bedroom when we first married, complete with a faux painting technique that was more bleh than yeah. We actually painted the walls together, so I cannot claim that as part of my 8 hour makeover. Really, it started out like this. I also went back and created custom closet systems in the his and her closets, which you can see here and here. We even staged our own reveal. We have two toddlers that are very close in age. If not for that reason alone, we wanted a master bedroom that felt like a relaxing retreat at the end of the day. It turns out that staging an 8 hour makeover is a LOT Of work. I had to plan the look of the room in advance, order everything, and then hide it throughout the house. Can you believe I hid the king size headboard for about a week?! A couple small things needed a bit of change up afterward. You may notice that the color of the frames in the video changed. Unfortunately the duvet I originally ordered from Crate and Barrel had a pretty major flaw, so it had to be exchanged for another. We are both very happy about how it all turned out. Here’s a look! *This posts contains affiliate links for your convenience. You can read my full policy here. One of the changes I am most happy about was deciding to do away with the dresser. I created built in drawers in the new custom closets, and it is SO much nicer. I also love the addition of a small sitting area. Of course it had to fit with the dog bed for Maddie, which may not be as photographic, but I believe in capturing reality. The focal point on this side of the room is the canvas prints of our kiddos and our wedding day. I had them printed up at Canvas HQ. I’m going to pause here and say a couple totally unsponsored words of praise along with some unsolicited advice. If there is anything worth splurging on it is pictures, and these are worth every cent. There’s a world of difference between a good print and a cheap one, so much so that I had to have that wedding print in the middle redone to match the quality of the other two when I had them printed at Canvas HQ. The wedding picture I had previously printed elsewhere, and the difference was painfully obvious. When I ordered the prints with the kids I accidentally selected the wrong finish on one. They contacted me immediately and asked if that was really what I wanted, completely saving me the horror of realizing my mistake once the finished order arrived. Talk about awesome. The other thing I love is the small secretary desk, which makes it possible for me to work on posts like this from the comfort of my own room if I please. Our room is now a comfortable retreat that we love. Now to just convince my husband to replace that carpeting with some wood floors! Here’s a source for everything in the room!